Sadly, it's not as simple as it should be. On Monday, hordes of angry Windows users pelted Microsoft with complaints about being lured into upgrading their PCs over the weekend. 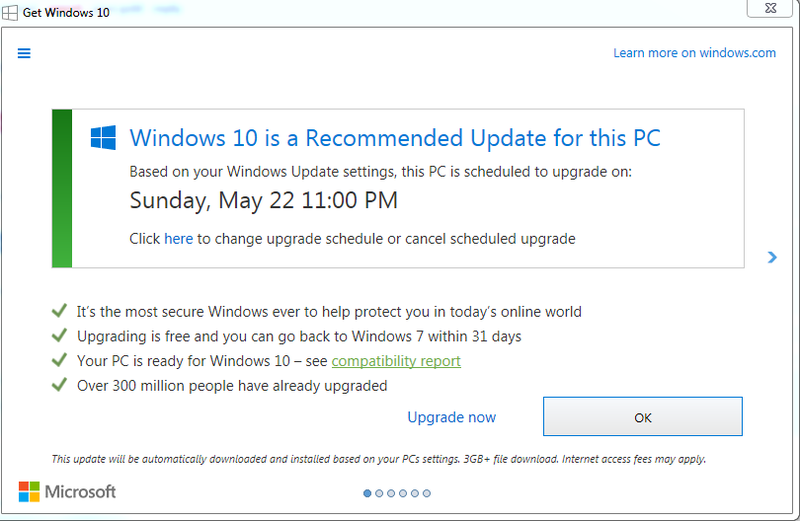 For months, Microsoft has been urging users running Windows 7 and Windows 8.1 to upgrade to Windows 10 before the free offer expires on July 29. But the series of dialog boxes and other messages that Microsoft has sent users have become increasingly deceptive, burying the opt-out links amid text that appears to commit users to the upgrade. Normally, closing the dialog box by clicking the red box in the upper righthand corner automatically opted out. Over the weekend, clicking that red box started opting users in to the upgrade. The company was unable to explain how closing a dialog box translated into a consumer’s desire to upgrade to Windows 10. 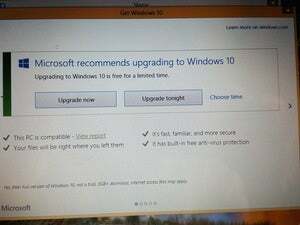 Microsoft representatives pointed out, however, that if you do mistakenly trigger the upgrade, you should still have an opportunity to opt out before it begins. Microsoft described the new procedure on an updated support page, which notes that users will be given "an additional opportunity for cancelling or rescheduling the upgrade." 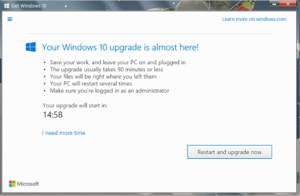 If you do click the close button and accidentally trigger the upgrade, you’re still not totally committed, Microsoft claims. “Based on customer feedback, in the most recent version of the Get Windows 10 (GWX) app, we confirm the time of your scheduled upgrade and provide you an additional opportunity for cancelling or rescheduling the upgrade,” Microsoft says. 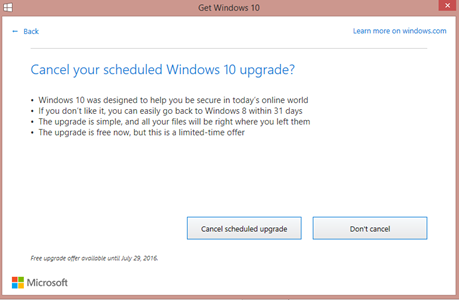 Here’s one opportunity to opt out of Windows 10. 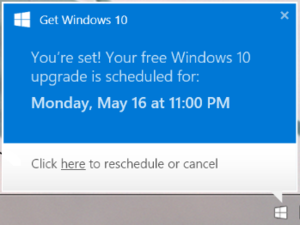 Note the link within the popup to reschedule or cancel the upgrade. It’s unclear how that long the popup actually hangs around, but it’s certainly no good to anyone if it appears in the middle of the night or quickly vanishes. If you've accidentally triggered the Windows 10 upgrade, you’ll receive a second, final alert: a 15-minute countdown timer that, again, is pretty useless if the upgrade takes place during a time when you’re away from your PC. The final countdown (to Windows 10). According to Microsoft, there’s also a second opportunity to opt out, part of the GWX app on your taskbar—the same Windows icon that appears in the reminder popup, above. Before you actually click that app, however, you’ll need to make sure you don’t have any existing GWX dialog boxes open, because you’re essentially relaunching the app. 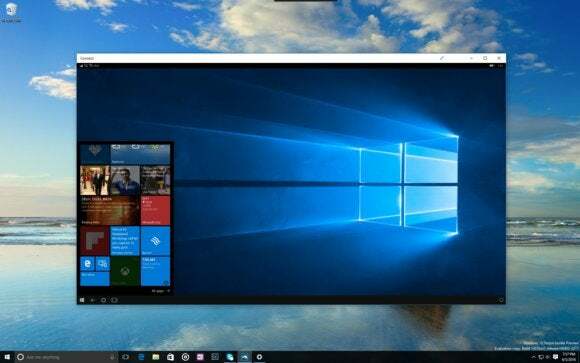 According to Microsoft, once you open the GWX app, you’ll either see messages saying Windows 10 is a Recommended Update for this PC, Microsoft recommends upgrading to Windows 10, or You signed up for Windows 10, and it’s ready! This is where the choices begin to resemble a "Choose Your Own Adventure” book, and not a customer-friendly opt-out process. You may notice that the Windows 10 is a Recommended Update for this PC dialog is the same popup window that, when closed via the red button, began this whole process. Don’t make the same mistake twice! 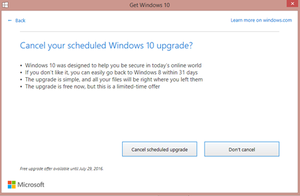 If you wish to opt out of Windows 10, click the “cancel scheduled upgrades” link. 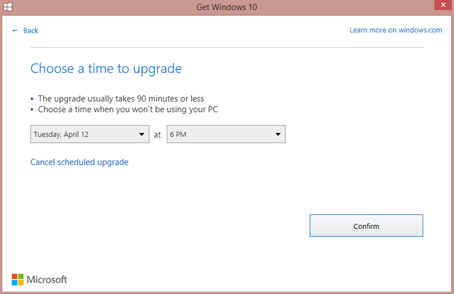 For the first two options, to opt out of Windows 10, look for and click the following link in the dialog box: Click here to change upgrade schedule or cancel scheduled upgrade. (Microsoft says that you can also click the red X to opt out, but we’ve heard this line before.) If you receive a popup that says, You’re set! click the link at the bottom to opt out, Microsoft says. For the screen, You signed up for Windows 10, and it’s ready! you should see a link to change upgrade schedule or cancel scheduled upgrade. In any event, if you want to get rid of Windows 10, you’ll want to end up on the screen titled Cancel your Windows 10 upgrade. Hopefully, this screen means that you’re out of the woods. 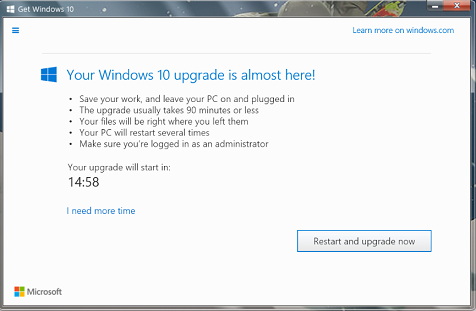 So does this mean that the Windows 10 upgrade monster has finally been slain? Well, as of revision 12.0 of Microsoft’s support document, yes. Hopefully things won’t change. Right-click (or press and hold) the Taskbar, then select Properties. In the Notification Area Icons window, for the GWX icon, select Hide icon and notifications. Note that you have the option of only showing the notifications without the icon, but why would you want that? In any event, that should end Microsoft’s Windows 10 nagging for good. Uh-oh! Did your PC upgrade to Windows 10 anyway? Here’s how to roll it back. As we’ve noted before, two third-party options pledge to block Windows 10 from being added to your computer: Never10, a simple utility, or GWX Control Panel, a more complex program that does the same thing. Both attempt to block relevant updates that force the upgrade, while allowing everything else through. 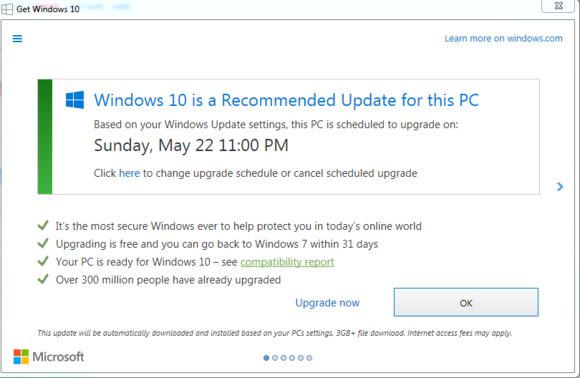 The closer we get to the end of the free upgrade period at the end of July, the more desperate Microsoft seems to be to push the installed base of Windows 7 and Windows 8.1 users on to Windows 10. By repurposing the close button to trigger the upgrade cycle, Microsoft is wandering close to accusations of “clickjacking,” which traditionally have used transparent windows or other trickery to launch malware or simply further the spread of Twitter worms. Microsoft still hasn’t said that why it chose this route, but it's not surprising that users see it as a low-down, dirty trick. It sullies the goodwill Microsoft engendered with its Insider program, the free upgrade, and its other work with the Windows community. Neither is it helpful that there’s only a labyrinthine, complicated process for Windows 7 and Windows 8.1 users to opt out of Windows 10. It’s small consolation that there actually is one, however. Let’s hope it remains.